WE’RE SAVING MORE money than ever, no matter what our age. That’s according to the latest Nationwide UK (Ireland)/ ESRI Savings Index. In July, the proportion of people saving regularly increased to 41% from 35%. This increase is occurring amongst both the over 50s and under 50s age-groups. 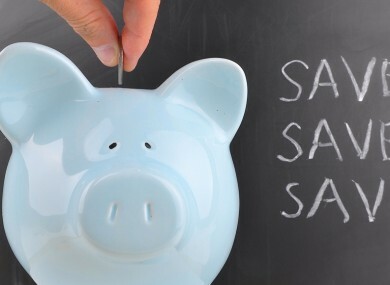 Since January, the level of regular saving has gradually improved and this month’s data represents a return to the normal long-term level of saving amongst consumers – and a reversal of a decline which started in autumn 2012, said the ESRI. There has been a reduction in the proportion of people who say they are saving less than they think they should – to 56% from 62% the previous month. The index saw a seven point increase versus the previous month when it came to saving sentiment here. The increase is primarily driven by an 18 point jump in the Savings Attitude Index, which asks people about their saving behaviour and how they feel about the amount they save. Again, this saw an increase – from to 127 from 109 last month. But there are major concerns about whether now is a good time to save and whether government policy encourages people to save. The Savings Environment sub-index, which gauges opinion on economic conditions and the impact of government policy on saving, decreased to 78 from 80 last month and 118 in July 2013. The savings environment index has now been in decline for four consecutive months. The proportion of people who believe that now is a good time to save fell to 25% in July from 26% last month and 32% a year ago. Meanwhile the amount of people who say that government policy discourages saving increased to 66% in July from 65% last month and 57% a year ago. 14% said they would spend it – that’s an increase from 13% last month. Meanwhile, 38% of people would save the money, an increase from 34% last month. The increase in the index this month reflects the improvement in the overall economy. It appears that people have absorbed the impact of the property tax introduced in 2012 and are now rebuilding their personal finances. This month’s data suggests that personal finances are improving with regular saving increased to normal levels, concluded the ESRI and Nationwide UK (Ireland). Email “We're saving more - but say the government isn't encouraging us”. Feedback on “We're saving more - but say the government isn't encouraging us”.